Brain Implants to Treat Depression! Brain Implants to Treat Depression? "The use of implantable mini-generators is more widespread than you probably think. Already, 190,000 patients are wearing electrodes in their heads to control Parkinson's disease tremors or spinal-cord stimulators to relieve pain or prevent urinary incontinence.... These numbers are likely to grow -- and quickly"
The number of Americans on anti-depressants has skyrocketed in the past decade In December 2004 the Washington Post reported that "One in 10 American women takes an antidepressant drug such as Prozac, Paxil or Zoloft, and the use of such drugs by all adults has nearly tripled in the last decade." With so many Americans looking for a quick fix for the depression illness they have been told that they have, it is no wonder the Cyberonics' stock has soared on the announcement of its implant approval. Is it really troubling, the thought of hundreds of thousands of Americans being implanted with a neurostimulating device to cure them of the blues? A device that could control their minds? The first thing that came to mind was DARPA's extensive funding of Brain Machine Work. According to a 2003 Boston Globe report, DARPA is funding a" $24 million enterprise called Brain Machine Interfaces is developing technology that promises to directly read thoughts from a living brain -- and even instill thoughts as well." " "It does not take much imagination to see in this the makings of a "Matrix"-like cyberpunk dystopia: chips that impose false memories, machines that scan for wayward thoughts, cognitively augmented government security forces that impose a ruthless order on a recalcitrant population. " What's next? Brain implants for dieting? Soma for the masses? Who knows, as the public consumption of neuro-stimulating implants becomes mainstream, accepted, and normal. Shares up 30 percent after firm gets conditional approval to sell anti-depression implants. LOS ANGELES - U.S. regulators have given conditional approval to Cyberonics Inc.'s bid to sell an implanted device to treat chronic depression, the company said Wednesday, sending its shares up over 30 percent. Houston-based Cyberonics (Research ) said it expects full U.S. Food and Administration approval by May. The VNS Therapy System is a pacemaker-like device implanted in the chest that delivers electrical impulses to the brain through an electrode attached to a nerve in the neck. Cyberonics already sells the implant for reducing seizures from epilepsy. It costs about $20,000, including surgical and hospital expenses, said Cyberonics Chief Executive Skip Cummins. The FDA said approval was conditional on final labeling, protocols for a post-marketing dosing study and patient registry as well as resolution of manufacturing issues and any outstanding clinical trial issues. "The conditions are straightforward. We are making good progress on resolving them," Cummins said. The device is the only product Cyberonics sells. Annual sales are about $110 million. Some analysts estimate the device's market for depression -- about 4.4 million Americans are estimated to suffer from treatment-resistant depression -- would be as much as ten times larger than the one for epilepsy. Last June, an FDA advisory panel voted 5-2 to recommend approval of the device for chronically depressed patients who had failed other treatments. The agency, however, turned down the company's application in August. Cyberonics then submitted an amended application, hoping to overcome FDA concerns about the device's safety and effectiveness for relieving severe depression. The conditional FDA approval is for patients who have failed at least four other treatment regimens, Cummins said. Side effects of the device include hoarseness and throat tingling. Shares of Cyberonics were up $9.19, or 33 percent, higher at $36.67 on the NASDAQ. The company said it is building its organization to support a potential late May launch of the product for depression. Cyberonics also said its sales and earnings for the fiscal third quarter ended in January will likely beat previous guidance of $25 million in sales and a net loss of $3.3 million, or 13 cents a share. Little wonder, then, that some of the biggest names in health care are in a scramble to get into the market. Most recently, in December, Johnson & Johnson ( JNJ ) bought implant-maker Guidant Corp. ( GDT ) for $23.9 billion. "Any organ that a nerve can influence -- and that's every organ in the body -- can be affected using this technology," says Dr. Ali R. Rezai, who is director of functional neurosurgery at the Cleveland Clinic. "It's a new era in neurology." The use of implantable mini-generators is more widespread than you probably think. Already, 190,000 patients are wearing electrodes in their heads to control Parkinson's disease tremors or spinal-cord stimulators to relieve pain or prevent urinary incontinence. Some 30,000 have wires threaded to the vagus nerve in the neck to treat epilepsy, while 60,000 have microtransmitters in the inner ear enabling them to hear. These numbers are likely to grow -- and quickly. One of the most promising devices is a $15,000 neurostimulator for chronic depression from Cyberonics Inc., which the Food & Drug Administration conditionally approved on Feb. 2. As neurostimulators get even smaller and their microchips more powerful, researchers foresee new uses for these implants. Advanced Bionics Corp., a startup that Boston Scientific Corp ( BSX ). acquired in 2004, is testing a rechargeable device so tiny that it can be injected almost anywhere in the body to treat pain or muscle dysfunction. Implants also could act as sensors, telling a miniature pump when to deliver a drug or customized protein to a precise location in the body. "The body is on fire with electricity," says Dr. Stephen N. Oesterle, chief medical officer at Medtronic Inc ( MDT )., the No. 1 maker of implantable electrical devices. "If you start with that concept, then all you need is imagination." The returns for investors may also be substantial. Today, most neurostimulators don't make money because years of research and development and marketing outlays overwhelm what are, in the beginning, only trickling revenue streams. Still, Advanced Neuromodulation Systems Inc. ( ANSI ), of Plano, Tex., averages gross margins of 70% on its spinal-cord device for chronic pain. Houston's Cyberonics, Medtronic, and Boston Scientific -- the other companies with FDA- approved neuromodulators -- all boast even fatter margins. As sales grow, device makers will be able to spread their expenses over a wider base and become more efficient manufacturers. If the FDA approves their new treatments, says Jan D. Wald, a medical-device analyst at A.G. Edwards & Sons Inc. ( AGE ) in Boston, pretax earnings at the smaller companies should rise to 20% to 30% of revenue, equaling the return on more established products such as pacemakers. "The market is close to an inflection point," he says. Mark Landy, an analyst at Susquehanna Financial Group in Bala Cynwyd, Pa., also sees the market growing by 20% for the next several years. For now, though, he cautions against buying these stocks, saying the share prices are already based on outsize returns. Neurostimulation has another selling point: Because the implants alter tissue only at their points of contact, side effects are generally negligible. In epilepsy patients with electrodes implanted to pulse the vagus nerve, the most dire side effect is hoarseness, sometimes accompanied by the desire to clear the throat. Only 3% of such patients report this minor complication. Most say they can't sense the stimulation at all. Contrast that with the most common drug treatment, Dilantin, which can cause dizziness and nausea and can lead to liver damage. "Think of the device as a smart bomb,"says Advanced Neuromodulation ( ANSI ) CEO Christopher G. Chavez. One in 10 American women takes an antidepressant drug such as Prozac, Paxil or Zoloft, and the use of such drugs by all adults has nearly tripled in the last decade, according to the latest figures on American health released yesterday by the federal government. Those numbers are among a broad array of changes in health and health care use in the United States identified in the report. It confirmed that prescription drug costs are soaring faster than any other area of medical care as ever-increasing numbers of Americans take drugs for psychiatric conditions, to lower their cholesterol, to control asthma and for a wide range of other reasons. In 2002, the latest year for which data were available, the total tab for health care soared to $1.6 trillion -- of which prescription drugs accounted for $162 billion, the report found. Drug costs rose by 15 percent over the year before, driven by a combination of more expensive medicines and increased use. The report comes at a time when questions are growing about the costs and safety of many prescription drugs. The Food and Drug Administration recently concluded that antidepressants can increase the risk of suicidal behavior among children, and the manufacturer of Vioxx abruptly recalled the popular painkiller for safety reasons. A senior FDA official testified in Congress last month that he believes five other approved drugs are dangerous and should be taken off the market. Antidepressant drugs called selective serotonin reuptake inhibitors (SSRIs) showed some of the largest increases in use, the report said. By 2000, the proportion of adults using such drugs had nearly tripled, compared with the data set that ended in 1994. In 2002, more than one in three doctor's office visits by women involved a prescription for an antidepressant, said Amy Bernstein, project director for the report issued by the Center for Mental Health Services of the Centers for Disease Control and Prevention. "It gives you an idea of what is happening during these visits," said Bernstein, who explained that the statistic included patients already on the drugs and those getting a new prescription. The number of children getting psychiatric drugs also soared. In 2002, about 6 percent of all boys and girls were taking antidepressants, triple the rate in the period 1994-96. And about 14 percent of boys -- nearly one in seven -- were on stimulant drugs in 2002, double the number in 1994-96, the report found. Stimulant drugs are usually used to treat attention deficit disorder. The number of adults taking cholesterol-lowering statin drugs nearly quadrupled from 1995-96 to 2001-02, the report found. Overall, 44 percent of all Americans, including children, were taking at least one prescription drug in 1999-2000, a statistically significant 5 percent increase since 1994. The proportion taking three or more prescription drugs increased from 12 to 17 percent during that same time, Bernstein said. "Factors affecting the recent increase in utilization of medications include the growth of third-party insurance coverage for drugs, the availability of successful new drugs, marketing to physicians and increasingly directly to consumers, and clinical guidelines recommending increased utilization of medications for conditions such as high cholesterol, acid-reflux disease, and asthma," the report concluded. Julie Zito, a pharmaco-epidemiologist at the University of Maryland at Baltimore, said it is difficult to characterize as good or bad the increased use of drugs without studies that ask how people are faring as a result. "As the numbers keep growing year after year after year, and larger proportions of the population appear to be suffering from conditions or getting treatments they may or may not be benefiting from, that would be an argument to follow large cohorts of patients in community studies to assess effectiveness and safety," she said. 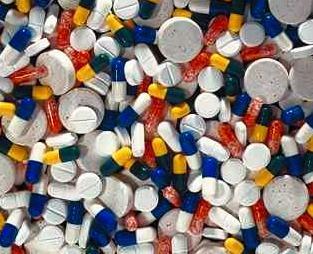 The drug industry's umbrella trade group said the increased use of medications is a good thing. "We have more medicines and better medicines for more diseases, and patients are being more effectively treated," said Jeff Trewhitt, a spokesman for the Pharmaceutical Research and Manufacturers of America. "They are living longer largely because of new treatments, and that is good news." Trewhitt said there are numerous examples of how increased use of drugs -- such as cholesterol-lowering statins -- reduce overall health care costs by controlling heart disease and reducing more expensive hospitalizations. On the increase in antidepressant use, Trewhitt said, "I don't know how to read that. We just don't have any information -- it's not something we have studied." (Propaganda Piece from Cyborg Proponent Warwick): What Types of Cyborg Implants Are Available Now? I was wondering if you would be able to tell me a little more about the types of implants that we have available at the moment. I also am curious about what kinds of possibilities there are for neural networks such as the ability to create a human who has remote access to the Web without need of a computer. Firstly there are a lot of implants for restorative purposes, such as heart pacemakers and cochlea implants. You could even count such things as implants for artistic purposes and artificial hips. There are also a number of tagging type of implants that can be read either barcode reader style or from a remote receiver station. However, the most exciting type of implants are those linking the brain and nervous system electrically with a computer—and thence onto the Internet. Collar electrodes : These fit snuggly around nerve bundles and make a good contact when firmly crimped around the nerves. Single electrode connections : These can be inserted externally to make a direct electrical connection. Electrode groups : Single electrode connections grouped together, these are often silicon tipped and can be used in such things as retina arrays. Microelectrode arrays : These can be etched arrays that lie flat against a neural surface. They come in several variations. There are also spiked electrodes that look something like a hairbrush and can have several electrode connections on each spike. There are also spiked electrodes with only tipped electrode points. All electrodes can be the same length or they can be wedge shaped. Many of these different types of implants have been used for short-term culture and slice tests, usually with nonhuman tissue. For long-term human use and experimentation not involving repair (as with retina arrays), as far as I am aware there is only one reported experiment, from October 2003 ( Archives of Neurology, Vol. 60, No. 10, pp. 1369-1373). As for computer-less remote access to the web, presumably to include bidirectional memory exchanges, I feel that this has to be seen as a long way off—10 years at the very least. 100,000 People Die Every Year Just from the Drugs Alone!